Single-family home costs across the Seattle metro area declined 1.3 percent in September from a month prior, according to the Case-Shiller home-price index, released Tuesday. That follows a 1.6 percent drop the month before, and a 0.5 percent drop the month before that. Prices haven’t fallen this fast since 2011, when the market was still bottoming out after the recession. No other metro area saw prices tick down more than 0.3 percent in the past month. 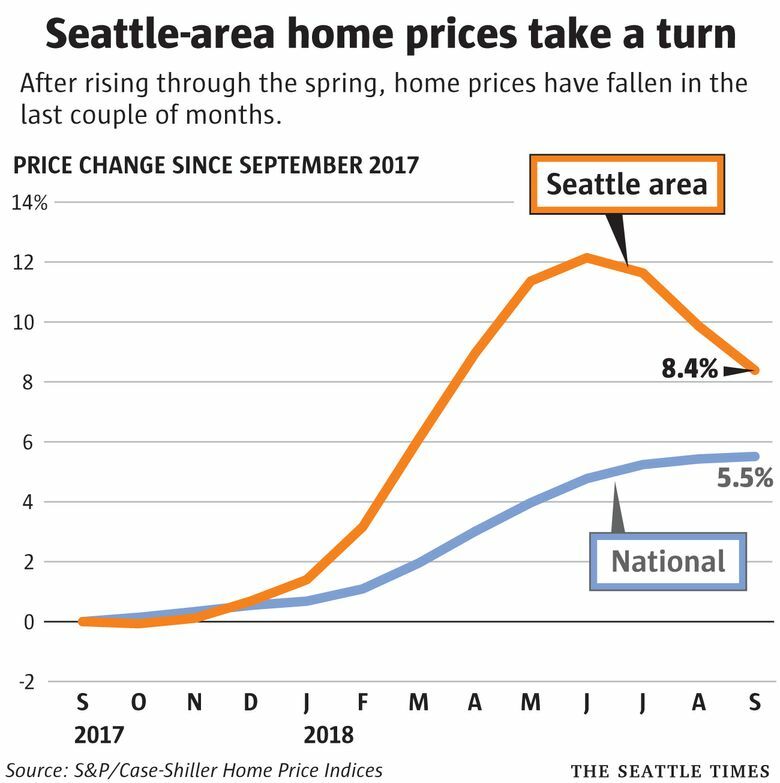 Across the last two months, Seattle’s decline was more than triple the next-highest metro area (San Diego, where prices declined 0.8 percent). The index is notable in that it covers the full metro area from Pierce to King to Snohomish counties. Prices had been falling from their spring highs in Seattle and parts of the Eastside, but the market had still been humming along on the outer reaches of the region until recently; now, prices are falling on a month-over-month basis just about everywhere. Brokers and buyers have reported fatigue as prices have climbed to increasingly unaffordable levels after six years of steep price growth that has far outpaced wage gains. At the same time, rents have stayed flat while interest rates continue to tick up, putting less pressure on buyers to act now. More homes are sitting on the market unsold, prompting sellers to cut list prices and be willing to negotiate. The declines each of the last few months are relatively small, but taken together they represent quite the reversal. Prices have decreased 3.3 percent over the last three months; earlier this year, prices were soaring as much as 8 percent every three months. Previously, home values hadn’t dropped even 1 percent over any three-month span since the market began rising from the recession in 2012. In the average three-month period in that span, prices grew almost 3 percent. For the past 12 months, prices were up 8.4 percent — the third-highest in the country, behind Las Vegas and San Francisco. But that was the smallest increase in three years and down from 13.6 percent growth seen this spring. 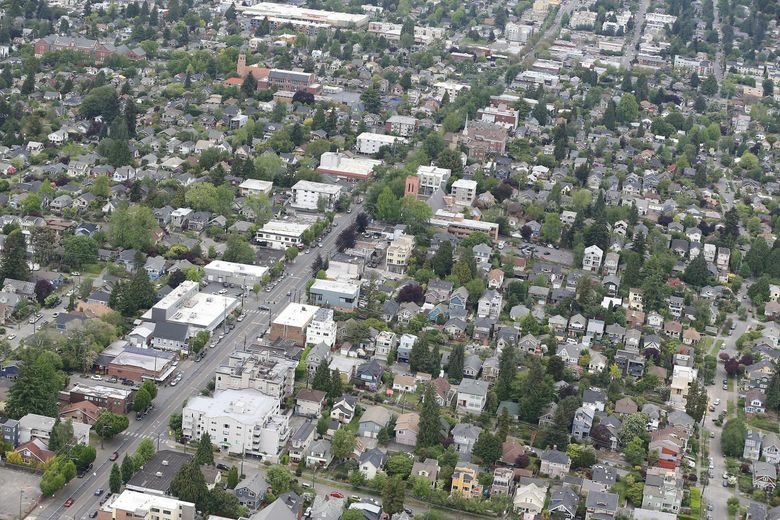 As has been the case, most of the increase over the past year was concentrated in the cheapest one-third of homes in the region — mostly in Pierce and northern Snohomish counties, where prices went up 11.2 percent in the past year. Price growth slowed nationally as well, down to 5.5 percent on a year-over-year basis, as interest rates rise, home construction wanes and sales tick down. Previously, Seattle-area home prices had been rising at more than twice the national average. The median house costs $750,000 in Seattle and $890,000 on the Eastside, both down about $80,000 from their record highs set in the spring and summer. Of course the recent declines have done little to counteract the real-estate market’s boom that has dominated much of this decade. Since 2012, prices across the metro area are still up 61 percent more than inflation. And compared to the old 2007 bubble peak, prices are 7 percent higher after adjusting for inflation.